Welcome to the wonderful world of teddy bears by Gund! These amazing teddy bears range in style from the classic or traditional bears to the more modern designs that reflect Gund's ongoing commitment to moving their product line forward. Gund Teddy bears are made for people of all ages and include lots of pink and blue baby safe teddy bears as well as medium and large teddy bears for older children and collectors. Each teddy bear is thoughtfully designed to have its own special personality and character. Mainstays like Alfie and Philbin are available in multiple sizes and are undeniably adorable teddy bears that have been making people smile for years. While there are constants, Gund continues to increase and improve their teddy bear collection by adding new teddy bears to the bunch every year. Their imaginative designs continually lead to teddy bear characters that are every bit as charming and lovable as the bears that came before them. 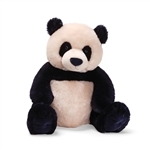 Teddy bears by Gund do lots of things but disappoint is not one of them! You can find most of Gund's teddy bears on the following pages but we currently do not carry them all. If you have a particular Gund teddy bear in mind and don't see it here just give us a call and we will happily do everything that we can to find it for you. We understand that there is no substitute for a Gund teddy bear!